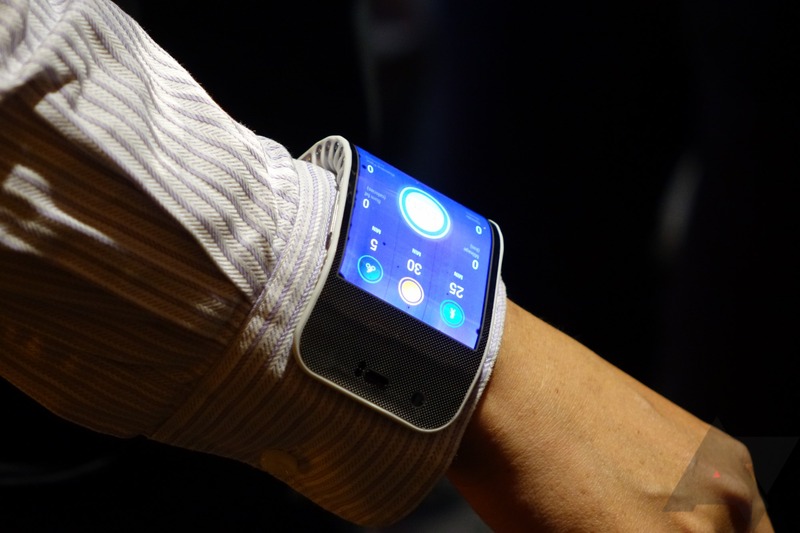 Yesterday at Lenovo's Tech World event, the company demoed two concept products that were, frankly, kind of amazing. 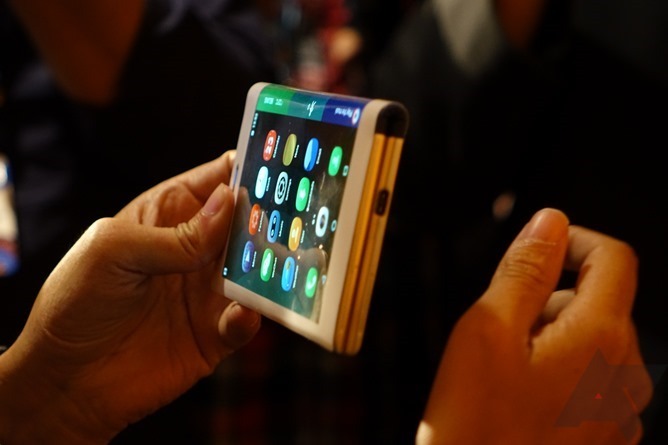 A foldable tablet-phone, and a bendable wrist-phone. While the on-stage demo didn't really tell us much about them, I sat in on a talk where we were allowed to take a closer look (though not touch, sadly) at these concept devices while learning more about them though. What did I come away with? Well, first off, they are definitely engineering concepts. These devices are nowhere near robust enough for use out in the real world, and both looked, well, flimsy. But they worked - and that's what really counts with crazy stuff like this that just four or five years ago we would have dismissed as a fantasy. 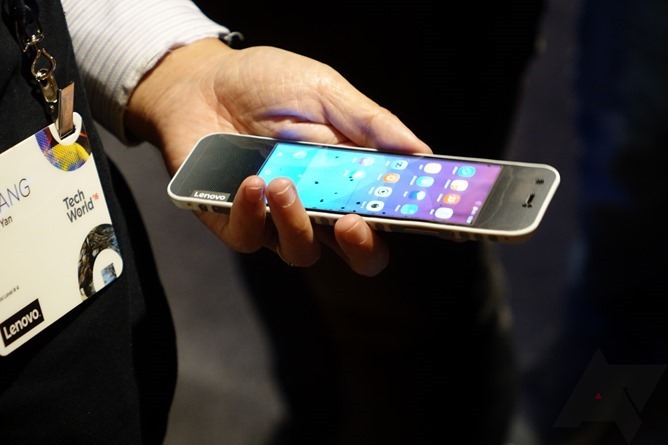 These are real smartphones that you can freaking bend and fold. 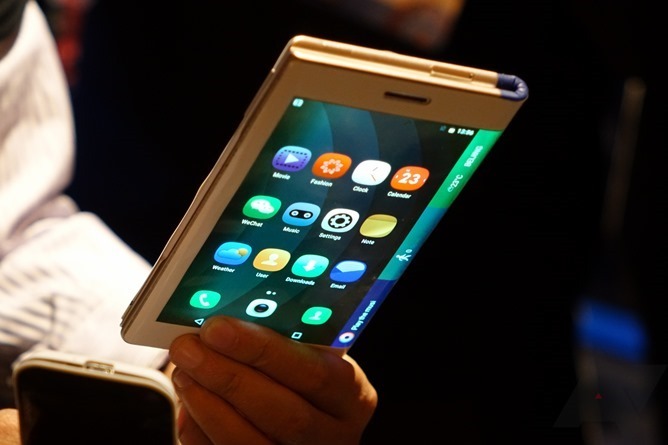 According to Lenovo, the real trick with foldable and bendable devices isn't so much the display - a lot of progress has been made there - it's the rest of the thing. 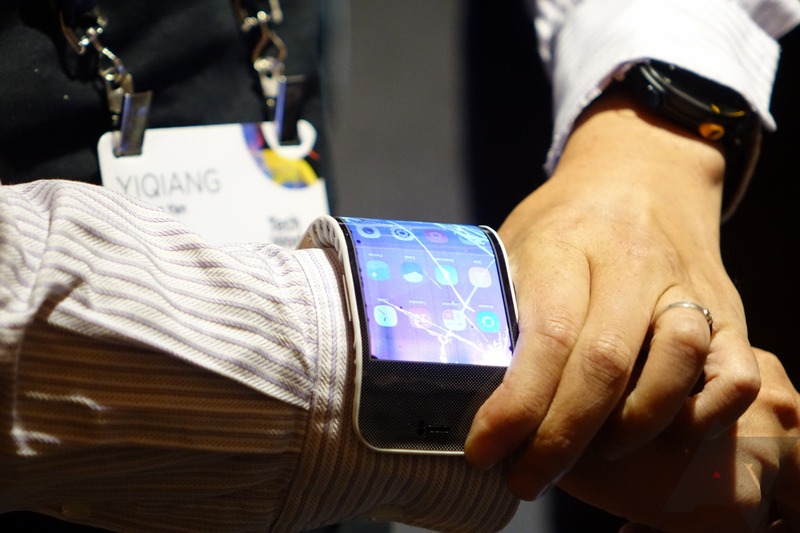 Lenovo showed us two different approaches to dealing with the unique challenges of foldable and bendable devices. The slap-bracelet wrist phone goes for what you see above - an almost steampunk level of hinges that allow the bracelet to articulate. You can see the gaps along the phone where there are no hinges, and that's where the non-bendable electronic guts live (sorry, Lenovo hasn't invented flexible smartphone SoCs yet). The screen isn't cracked - that's a gag demo. Engineer humor. But you can see the areas where the display has died - the black pockmarks are a very typical result of excessive stress on OLED panels. 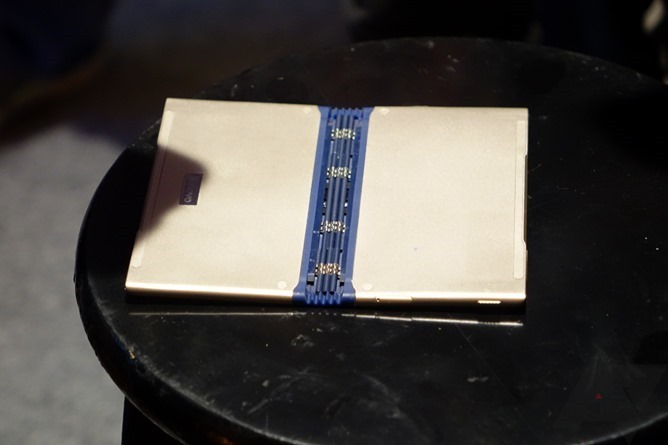 Lenovo claims that even with all these hinges, a device like this wouldn't be much heavier or thicker than a typical smartphone - which is impressive. 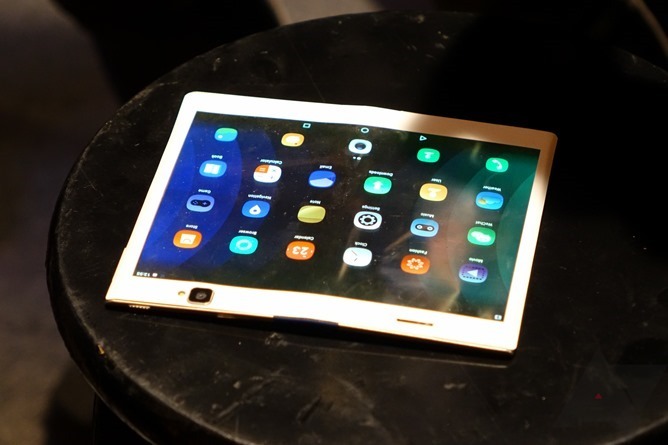 The second approach was the foldable tablet-phone design. 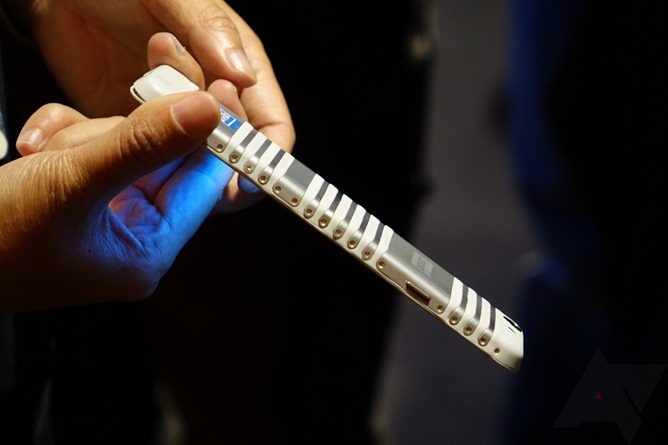 The idea here is that you have something you can hold, use, put in your pocket, and take calls on just like a normal phone - by folding it in half. Unfolded, it's an eight-inch tablet. And yes, this engineering concept has developed a... kink... along where the hinge is. Hey, it's a work in progress. Now, looking at the picture a day removed from actually being there, I imagine this photo doesn't quite convey exactly how this thing looks and feels, so let me see if I can explain a bit. The cover for the display itself is plastic, which is obviously highly flexible. 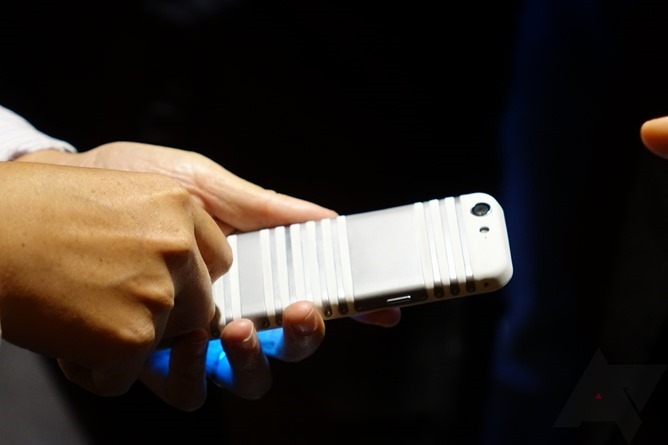 It sort of looks like the screen has a loosely-fitting protective cover on it, because the plastic needs to be able to stretch when the device is folded up. So, it's pretty weird to look at, and I bet it's also kind of weird to touch. When it's folded up, it looks much more normal (apart from the semi-circular edge), and it just seems like a thick smartphone. I can definitely see the appeal of this concept, though a plastic screen that's going to get easily scratched up and a, frankly, really ugly and seemingly not-quite-fully-baked hinge design make it hard to envision a practical product just yet. But these are just ideas, and they're impressive ones at that. Lenovo wouldn't say who was building its OLED panels, but they did say who wasn't: Samsung or LG - Lenovo is apparently working with a smaller producer. Asked when we could expect products with flexible and foldable displays on the market, the answer was tepid at first, but then someone followed up with "5 years? 10 years?" and the presenter responded that the technology, in his opinion, would be consumer-ready sooner than five years. Granted, there has to be demand for products like these, and they have to be cost-effective - two very big issues to tackle, let alone ongoing concerns about durability in the real-world. Still, it was pretty cool to see some actual foldable and flexible display devices - I was certainly impressed.